AC Drives by US Drives @ Carotron, Inc.
Carotron offers High Horsepower digital AC drives through one of our top companion companies — US Drives. US Drives is based in Niagara Falls, NY, and provides high quality drives for tough applications in difficult conditions of operation that can cause most other AC motor drives to fail. Are you experiencing problems with power line transients, high ambient temperatures, AC line harmonics, high AC line voltages, regenerative loads, or other application hurdles? Carotron can provide the solution with our high horsepower AC drive selection from US Drives. 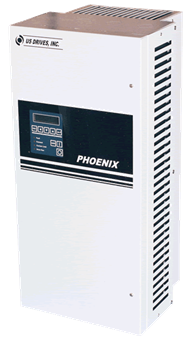 The High Horsepower models of the Phoenix DX Sensorless AC Vector Drive is just one example. This drive was created with one goal in mind… to develop the most rugged and reliable digital AC drive in the industry! Adjustable frequency motor control for AC motors. May be used with synchronous AC motors, squirrel cage induction, or conventional constant speed motors. Also… US Drives offers a 3-Year Warranty! For more information about US Drives High Horsepower AC Drives, call 1-888-286-8614 or e-mail us today!